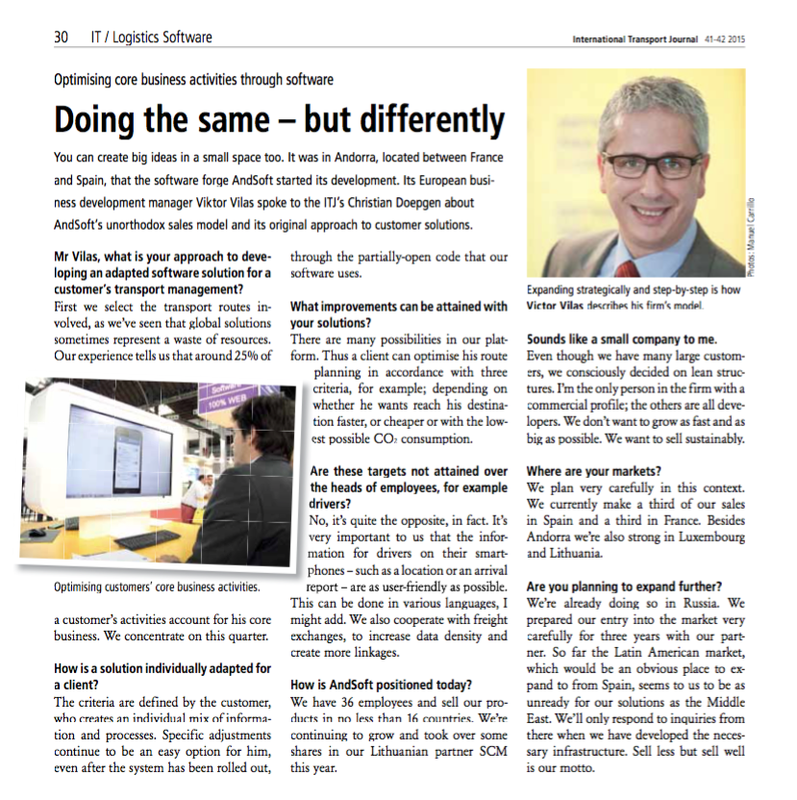 Mr Vilas, what is your approach to deve­loping an adapted software solution for a customer’s transport management?. First we select the transport routes involved, as we’ve seen that global solutions sometimes represent a waste of resources. Our experience tells us that around 25% of a customer’s activities account for his core business. We concentrate on this quarter. How is a solution individually adapted for a client?. The criteria are defined by the customer, who creates an individual mix of information and processes. Specific adjustments continue to be an easy option for him, even after the system has been rolled out, through the partially-open code that our software uses. What improvements can be attained with your solutions?. There are many possibilities in our platform. Thus a client can optimise his route planning in accordance with three criteria, for example; depending on whether he wants reach his destination faster, or cheaper or with the lowest possible CO2 consumption. Are these targets not attained over the heads of employees, for example drives?. No, it’s quite the opposite, in fact. It’s very important to us that the infor­mation for drivers on their smartphones – such as a location or an arrival report – are as user-friendly as possible. This can be done in various languages, I might add. We also cooperate with freight exchanges, to increase data density and create more linkages. How is AndSoft positioned today?. We have 36 employees and sell our pro­ducts in no less than 16 countries. We’re continuing to grow and took over some shares in our Lithuanian partner SCM this year. Sounds like a small company to me. Even though we have many large customers, we consciously decided on lean structures. I’m the only person in the firm with a commercial profile; the others are all deve­lopers. We don’t want to grow as fast and as big as possible. We want to sell sustainably. We plan very carefully in this context. We currently make a third of our sales in Spain and a third in France. Besides ­Andorra we’re also strong in Luxembourg and Lithuania. Are you planning to expand further?. We’re already doing so in Russia. We prepared our entry into the market very carefully for three years with our partner. So far the Latin American market, which would be an obvious place to expand to from Spain, seems to us to be as unready for our solutions as the Middle East. We’ll only respond to inquiries from there when we have developed the necessary infrastructure. Sell less but sell well is our motto.